Assassin’s Creed fans sure welcomed Ubisoft’s announcement that the series would return this year, after the company failed to release a major Assassin’s Creed game in 2016. The next game in the franchise will be titled Assassin’s Creed Origins, and will feature an origin story explaining how the Assassins came to be, which will be told through the eyes of Egyptian protagonist Bayek. And the game’s reveal trailer shown at E3 this year sure looked the part, showing off Assassin’s Creed Origins very pretty Egyptian setting and gameplay, with the game expected to improve on what was offered in the earlier games when it comes to combat, amongst other things. 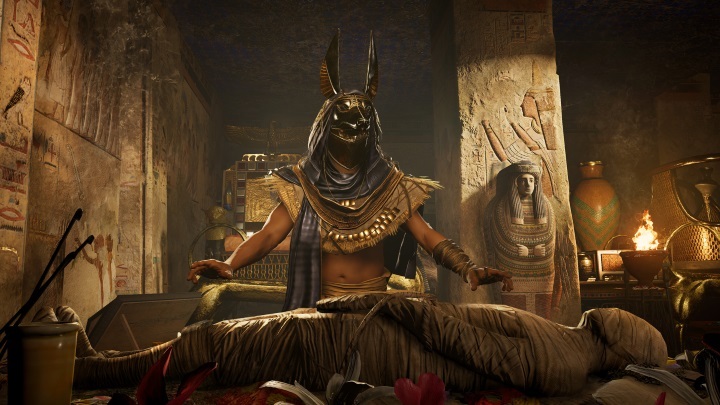 Of course, since this game marks the return of Assassin’s Creed to the spotlight, Ubisoft will be offering no less than six different editions of the game when Origins ships this October. This is an unprecedented thing for a video game, and what’s more shocking is that there will even be a collector’s edition priced at a hefty $799.99. For comparisons sake, this is more than Microsoft’s upcoming Xbox One X console will cost, actually you could buy a video game console and a few games with this kind of money. Either way, here follow the contents of this collector’s edition of Assassin’s Creed, so that you can make up your mind about whether it’s worth the price tag Ubisoft is asking for or not. 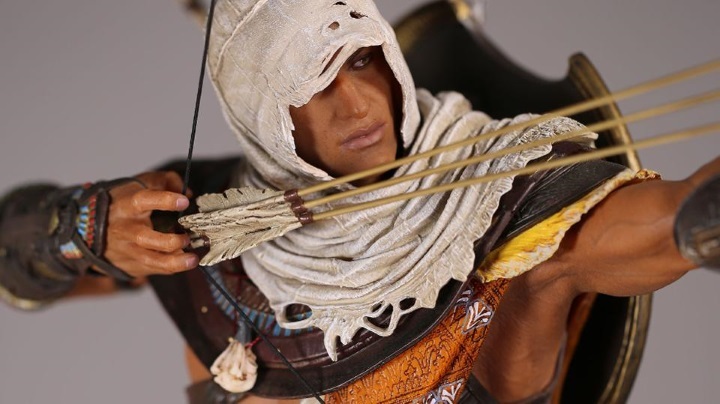 Amongst the goodies you will find in this editions’ large box is a 28.7 inch (about 73 cm) statue of Bayek, the game’s protagonist. He’s seen wielding his bow (which can fire multiple arrows at once in the game), and has his trusty pet eagle on his shoulder (which will be used to scout the map in Origins, as Ubisoft has abandoned the tower climbing mechanic used to reveal the map in the earlier games). This statue is made of resin, and is actually quite impressive as can be seen in the image below. Also made of resin is the replica of Bayek’s eagle skull amulet which also comes with this collector’s edition of the game, even if it won’t be such a great decorative item for many though. 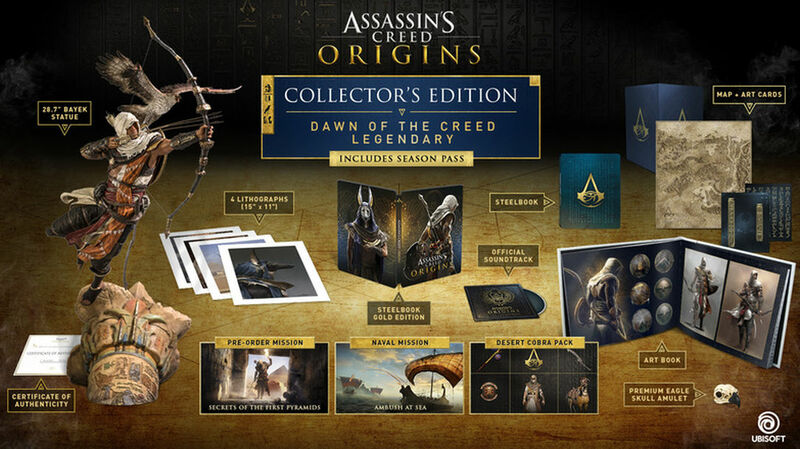 There are more items in the Dawn of the Creed Legendary Edition’s box, including not one but two Steelbooks, the first of which is the one that ships with the Gold Steelbook Edition of Assassin’s Creed Origins and includes the game’s Blu-ray disc. The second is adorned with the now world famous Assassin’s Creed logo on the front cover, and will surely make for a nice collectible item. Additionally, there are four lithographs featuring images and art from the game. These are 15” x 11” (38 cm x 28 cm) in size and are signed by the artists at development studio Ubisoft Montreal, which sure is a nice touch. This edition includes other extras that will surely be welcome by Assassin’s Creed fans, including a map which shows the areas you will be able to visit in the game, plus several art cards featuring symbology from the game’s period such as hieroglyphs. There’s also a CD which includes Assassin’s Creed Origins official soundtrack, which will likely be a good listen considering that the music in earlier Assassin’s Creed games has been some of the best heard in video games to date. Additionally, this collector’s edition includes several digital extras, amongst which is an additional mission titled “Ambush at Sea”, plus the “Desert Cobra Pack”. The latter includes the following goodies: the Fangs Horse Companion, the Desert Cobra Outfit, the Legendary Snake Shield, the Eye of Apep staff, and the Fang Sickle Sword. All these will surely do the trick if you want your character in Assassin’s Creed Origins to look the part, that’s for sure. Another worthwhile extra is the game’s season pass, which will grant you access to any expansion packs or any other content Ubisoft decides to put out for the game after release. And since this Dawn of the Creed Legendary Edition is such a premium item, it also comes with a certificate of authenticity, proof that you are one amongst the other 999 buyers of this no doubt very exclusive edition of Assassin’s Creed Origins. Of course, even if this edition of Ubisoft’s eagerly-anticipated game is not beyond your means, you may still think it is beyond lunacy to drop $800 on a video game, even on a collector’s edition packed with extras such as this one, which Ubisoft will be putting on sale next fall. So more budget conscious buyers who still want to get hold of a collector’s edition of Assassin’s Creed Origins might want to set their sights instead on the Gods Edition, which is priced at a more reasonable $119.99 and includes some pretty good extras as well. Either way, there is no doubt that Assassin’s Creed Origins is one of the most eagerly awaited video games of the year, and one that many gamers won’t want to miss next fall, despite the great number of quality video games slated for release in the second half of 2017. Although we still have to wait until October 27 in order to find out whether this next instalment in Ubisoft’s long-running series ends up living up to the hype, and if Ubisoft can deliver another unforgettable Assassin’s Creed adventure like the earlier Assassin’s Creed II and Black Flag were back in the day.